Tell Magu to leave me alone, Trump didn’t go after Obama’s wife – Patience Jonathan tells President Buhari – Royal Times of Nigeria. 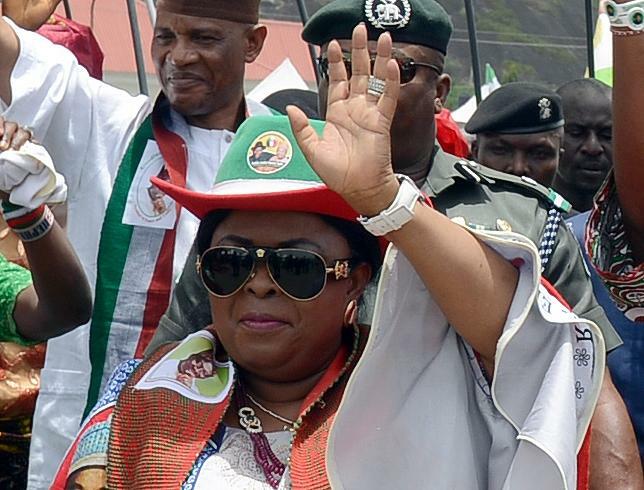 Former First lady, Patience Jonathan, has asked President Buhari to tell the acting chairman of the Economic and Financial Crimes Commission (EFCC), to leave her alone. In a statement released by her chief press secretary Belema, Meshack-Hart, Mrs Jonathan said Magu was being used to destroy the image of her family because of her role in the 2015 elections in which she campaigned against President Buhari. She further said that US president, Donald Trump, is not using the law enforcement agents against former first lady, Michelle Obama, despite the fact that she campaigned against him during their last election. “We wish to place it on record that in the history of this country, no wife of any President had been so far investigated in such flagrantly vindictive and disgraceful manner, as has been the fate of Mrs. Jonathan, in the hands of Magu’s EFCC. As a tradition, every first lady in this country has had one pet project or the other, with which they sought to intervene in the lives of the less privileged. Mrs. Jonathan started her NGO in Bayelsa State 11 years ago when her husband was the Governor of the State. With it, she has, over the years, touched the lives of many Nigerians in different ways. It is then surprising that while other First ladies and their pet projects were left alone, it is only her activities and that of her NGOs that are being subjected to indefinite probe and microscopic scrutiny by the Buhari administration. In a method that clearly bears out the axiom of giving a dog a bad name in order to hang it, Magu’s EFCC had maliciously linked Mrs. Jonathan to all kinds of fake possessions and properties around the country, including the Local Content Office in Yenagoa which is an arm of NNPC, Shoprite Complex, Nigerian Customs Guest House and Park View Hotel, both in Port Harcourt, as well as the residence of her neighbor who is a serving Senator. It has now come to a point where all the magnificent edifices in Abuja, Yenagoa or Port Harcourt are presented to the media as belonging to Mrs. Patience Jonathan. Not done, they also accuse her of owning several plots of land in many cities across the country, including places she has never visited. The most astonishing of all is that her close relatives are viciously being victimized, as their personal properties are also being investigated. It is either the EFCC is now led by people who cannot conduct proper investigations, or they are deliberately feeding the public with false information, in line with their sinister script to embarrass and browbeat the former first family.